At the far eastern end of Shoreham Beach is Shoreham Fort, also known as Shoreham Redoubt, or Kingston Redoubt. It was built in the 1850’s as a fortification against a possible French attack. By 1873 it was considered obsolete. I have noticed, as we pass fort after fort on our Coastal Path, that obsolescence seems to come quickly with coastal forts. There is a certain irony, I have decided, in the fact that buildings constructed to withstand being blown to smithereens are fast considered obsolete when they are not blown to smithereens. I suppose that in our fierce enthusiasm to kill each other, the technology of warfare moves faster than the technology of peace, and so defensive forts only have a short shelf live, at least as far as their original purpose is concerned. 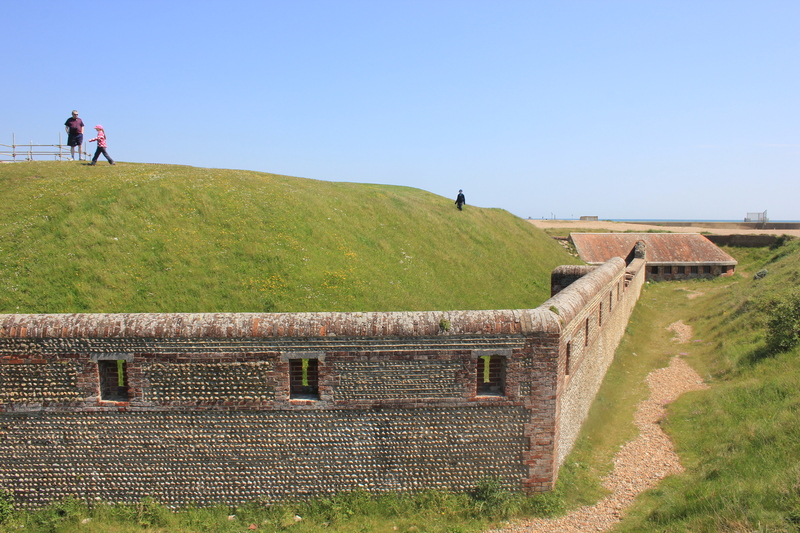 After Shoreham Fort was declared obsolete it managed to find another use for itself. In 1914 a scenic artist called Francis Lyndhurst (related to Nicholas Lyndhurst, who plays Rodney in Only Fools and Horses), built a glass studio here and began making films. In 1914 four silent movies were shot here. 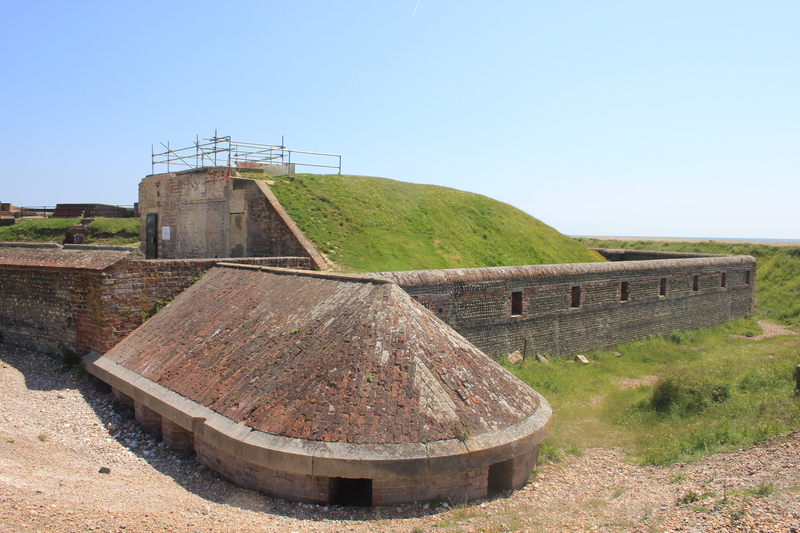 In World War Two, Shoreham Fort had a new lease of life, like so many of its brothers. 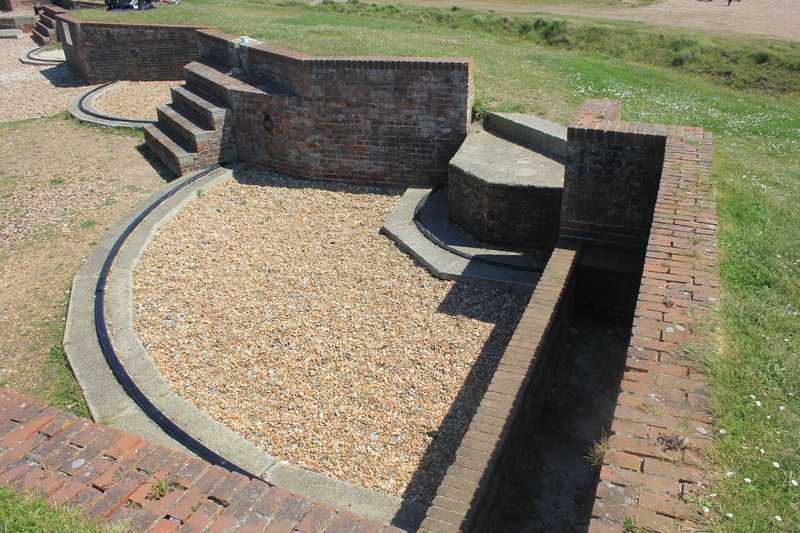 It was used as an emergency coastal battery, and a searchlight tower was built next to it. Today, there is still a small Coastwatch Station which maintains a presence on the site. 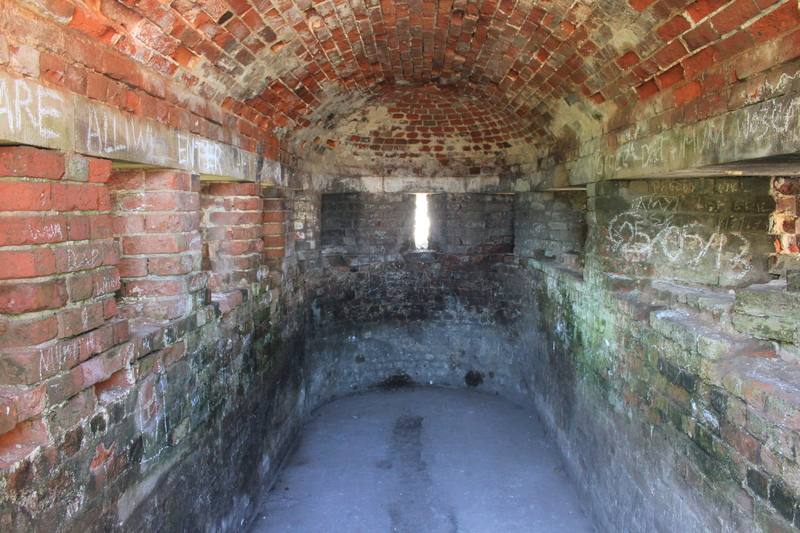 Shoreham Fort is one of those which is today partly restored and partly left open for members of the public to ramble over and poke their heads into odd nooks and crannies. I quite like this. You can just have a nosey round and find interesting places. We didn’t spend too long at the fort, though. As we clambered up the grass embankment, I looked to the south and saw the west arm of Shoreham Harbour lined with fishermen. During 435 miles of walking the coast of Britain, we had so far only seen one fish caught by a fisherman. The number of people lining the western arm looked like they may provide a bit of statistical enhancement to our dataset. We headed over to try our luck. This entry was posted in West Sussex and tagged coast, fort, shoreham, shoreham beach, travel, walking, west sussex. Bookmark the permalink. Well done sir, your blog has me thinking again about fishermen. Now it seems to me you have in a short time got rather good at spotting distant fishermen, and it seems reasonable to me to think that fish can do the same. I hope your spread sheet of fishermen statistics will include a column for stealth fishermen who are camouflaged in some way and compare their catch rate. Sorry to take so long to reply JP – for some reason your comment was automatically sent straight to spam. I only found it because I read other blogs were having some of their comments treated in a similar manner. I will think about your most excellent suggestion very carefully, though it does occur to me that I don’t know what a camouflaged fisherman actually looks like – a man in a giant fish suit holding a fishing rod springs to mind, but I suspect I’m on the wrong track with that one!